The Samothrace Nike is one of the most famous statues in the world. It should follow that the ship - an ancient war galley ! - she stands on should also be famous. Sadly, the ship is often forgotten and does not feature in many printed photos of the monument. galley fans don't forget the ship, though, and last year an interesting paper was published concerning it. 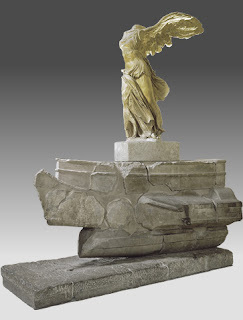 The Samothrace Nike stood in a fantastic location before it was probably destroyed in an earthquake and plundered for building stone. The remnants were identified as something interesting and taken to the Louvre by three expeditions in 1863 , 79 and 81. The viewer saw the ships standing in a pool of springwater. The blocks were put back together to reveal the remains of a beautiful statue standing on the prow of a ship. The monument was constructed between 220 and 185BC and is thought to be a memorial for one of the sea battles that Rhodes participated in against Philip V or Antiochous III. 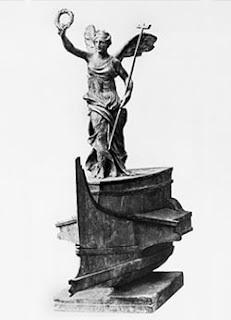 The Nike - goddess of victory - is standing on a victorious warship and proferring a victory garland. The sculpting is second only to the Parthenon frieze and the artist may have gone on to work on the Pergamum Altar frieze now in Berlin. The wings were additions, fitted into slots and cantilevered out over the shoulders, secured with pins. The figure was originally painted. Beautiful short film on Nike's discovery and recovery and restoration. The Nike was not just a pretty face, though. 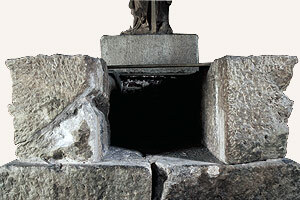 She was located at a crucial point to provide stability to the monument. The ram and stem actually stood proud of the base and gave an even more realistic appearance with the water running in beneath the ship! In order for the sculpted blocks to stand in this way the statue is positioned exactly and her mass counters the ship's prow perfectly. 17 blocks form the ship and it stands on a base of 6 flat blocks. 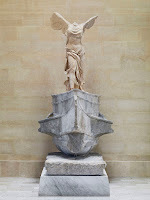 The ship and figure are of white Parian marble and the base of grey Rhodian marble. The scale of the sculpture is about 66% of the original size. This is calculated from the length of a rowing 'room' or interscalmium from the spacing of the oarports. The most remarkable thing about the ship is how fine-lined it is. A slim profile of an efficient bow for mounting a ram and cutting through the water. Originally visitors would have experienced the ship as gliding towards them over the water of the fountain pool. The type of ship depicted has been a bone of contention. It has variously been described as a Three, a Four, a 'lembus biremis' or a Trihemiolia. Last year a paper was published (HERE - 12dollar download) identifying the ship as a Four. 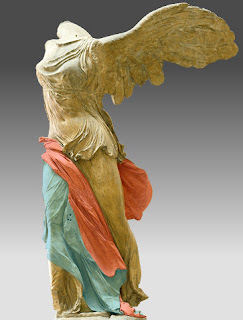 The recent conservation and reinstallation of the Nike of Samothrace, the restudy of its archaeological context and petrology, the collapse of the consensus that it celebrated the Rhodian naval victories at Side and Myonessos in 190 B.C.E., and the growing accord among naval historians that its ship is not a trihēmiolia together prompt a reexamination of its date and purpose. Fortunately, the monument offers three significant clues, all previously overlooked or underappreciated. 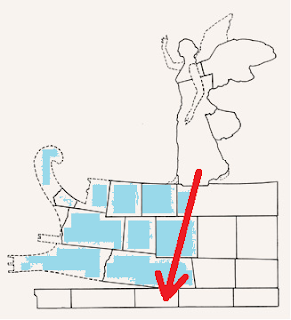 First, why was it dedicated on the remote island of Samothrace, and not, for example, on independent Delos? Second, although ancient galleys could not fight in gales and never did, why is it battling one? And third, why is its ship made of imported Rhodian marble and probably a quadrireme, a vessel superseded elsewhere by the quinquereme but still favored by the Rhodians? 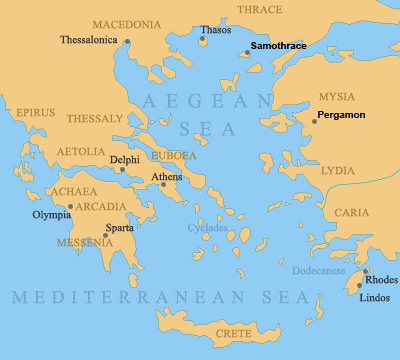 The Great Gods’ rescue of pious initiates from storms at sea and second-century B.C.E. 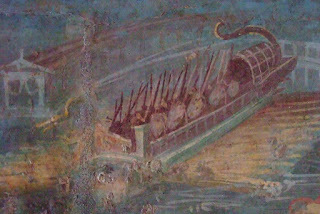 naval history point to one occasion in particular: Prousias II of Bithynia’s abortive invasion of Pergamon in 155, his impious assaults on the sanctuaries en route, his fleet’s sudden destruction by a storm, and the Rhodian contribution of five quadriremes to Attalos II’s successful naval counteroffensive in 154. The grounds for this were based upon the fact that a Four is a cataphract ship. 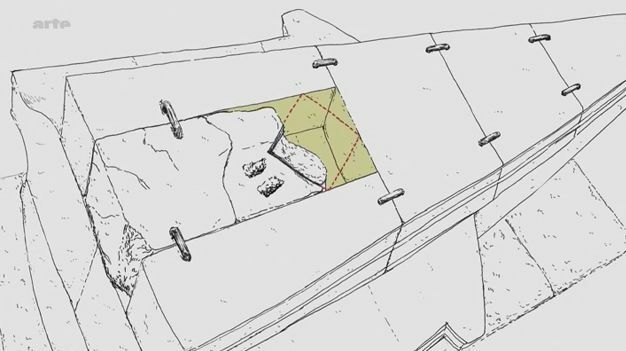 This means its hull was closed-in so it could fight at close quarters with the rowers protected from missiles. The author''s sole peg for his identification was the 'fact' that the Nike was standing on the deck of the ship. He reasons that because the other types were aphract ships with no deck then the Nike could not be standing on a deck that was not there. Unfortunately, when one looks at how the Nike has been standing for 80 years or so, and how she stands today, one can see she is standing on a deck which is not there. 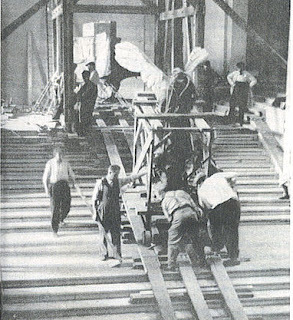 The blocks of the blocks of the monument were carefully made to include a gangway - or not. The Nike was until recently standing on a block over a gangway and now stands on one set in the gangway. 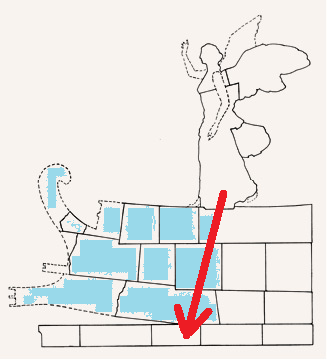 There is also the clue that she has wings and does not even need a deck to stand on ! The gangway with Nike set over it. If only one could always see round the sides or back of museum exhibits ! If there was a perfectly made block missing then there is no gangway. There is no detail engraved on the top of the blocks, maybe because the viewer could never see downward onto it. Filling the gap - fragments left behind on Samothrake maybe. If the Nike is not standing on a Four then the rest of the arguments become weaker. The campaign against Bithynia was not a particularly high point in Rhodian history. Be that as it may Stewart's theory has one less place to stand on if there was a gangway or if the gangway was never represented. Even if there is no gangway, the Nike is standing on the foredeck which would be present regardless whether the rest of the ship was decked-over or not. The foredeck does not allow one to identify if the ship was cataphract or not. The ram is also a factor to consider. The Athlit ram is a proabbale surviving ram from a Four. It is much heavier and larger than the rams found at the Ægetes Islands which are from ships approximating to Threes or Trihemioliai. 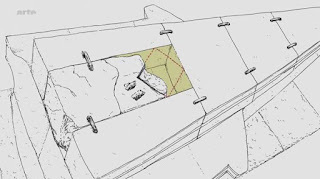 The reconstructed appropriate size for a ram on the Samothrace ship is that of a Three/Trihemiolia. The issue falls back to a basic argument about how far stone monuments copy a real prototype. The unfortunate answer is that they do..but.. If a lot of work is required for a part never to be seen was that work done ? Again, the answer is ..sometimes.... In addition, we have the practice of painting detail onto statues. 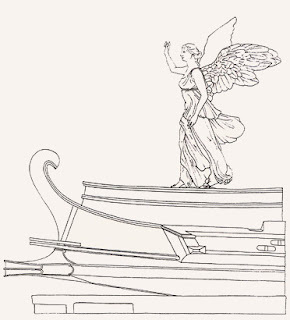 Morrison and Coates reckon there was painted detail along the sides of the hull above the oarbox to represent ventilation louvres for the oarsmen's benefit. This would argue for a cataphract ship. The renovation found no traces if the paint ever was there. In any case, the Trihemiolia was usually a closed-cataphract ship. The identification of the ship as a Trihemiolia is made on several grounds. 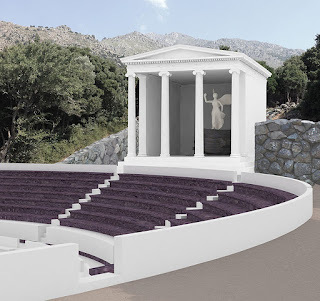 1)The monument is probably Rhodian and the Trihemiolia was closely identified with that state. 2)The ship shown has extremely fine lines. Larger ships were broader. 3)There are two sets of offset oarports in the oarbox. A Trihemiolia had a partial third, lower, thalamian row of ports but these would not be visible at the prow. The Trihemiolia was an economical ship which was very fast and handy and used by the Rhodians to patrol and police the sea lanes they earned their living from. Thier ships were out-stationed to smaller islands who could not defend themselves against pirate flotillas in a practice known as phylake which was an acknowledgement of responsibility to defend the common good (and your own trade). This is interesting, but for a different reason. I reviewed a set of rules by a Dutch author that were published by Partizan Press. There were all kinds of typos, errors, and sentences that just did not make sense. I then reviewed a different set of rules, also by Partizan Press, but by a German author. Those rules had a reputation for 'bad translations'. As I emailed the author, it turns out that publishers do little more than get a book printed – often outsourcing the project to other printers – and then send it into the distribution stream. Both authors indicated through email that largely *they* were responsible for the translation and editing. What used to be the traditional tasks performed by the publishers. The world of books – at least in our niche – has changed. This is not limited to small self-publishers like Ganesha Games. I would not be surprised if Osprey Publishing were not doing the same and these authors simply do not realize that they are responsible for the quality of their book, not Osprey. After seeing DAmatos written replies I can see he is no way to blame for Osprey's product. I think any criticism of the presentatiom is the publishers fault anf they have let him down. It is a bit shocking but I suspect the time it takes for proof reading and correction is now saved..and time is money. These are not academic publishers after all. I was initially very surprised when I looked closely at the texts but now am of the same opinion as you. Authors beware ! Especially if writing in a second language.